2 attackers and 2 defenders. you can use cones in a triangular shape to help dictate the scenario for them. knock it in, get it back, and teammate who knocks it back SPRINTS wide. in the example the attacker decides to pass to his teammate because the defender commits to him. if the defender takes the pass to the teammate away...it is okay for them to get to goal. 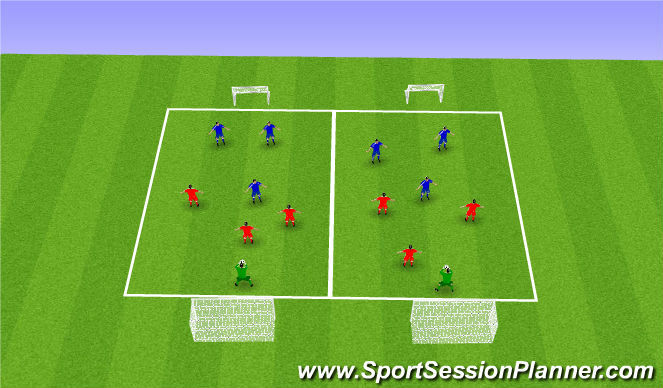 it could be helpful for you to keep the same attacker and defenders and rotate the passing players only. Focus on the changing of roles of the defending players, are they communicating to one another who is pressuring and who is supporting/covering? if a player is beaten do they recover and give cover to their now pressuring teammate? closest defender to the ball at any time needs to PRESSURE. 2nd closest needs to support/cover them. covering player is there so they aren&apos;t beaten on the DRIBBLE, so they can&apos;t be out wide marking an opponent on the sideline. -Defenders should be encouraged to communicate. who has pressure. -Where should the support/cover defender be? Off the shoulder of the pressure defender in case they get beat. 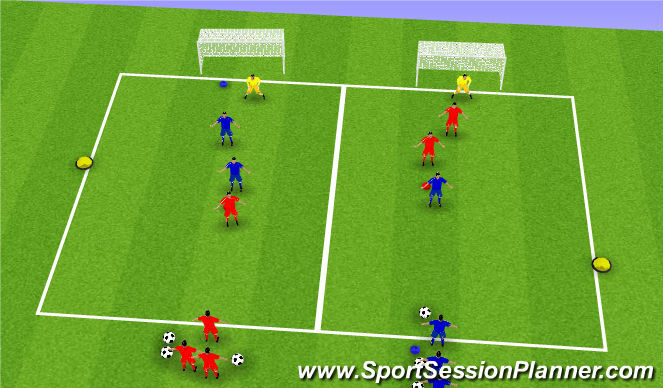 2v2 + goalie or 3v3 + goalie depending on numbers. one team scores on the big goal where there is a goalkeeper and the other team scores on a minigoal. Focus on the topic of defending. Players should implement what they have learned in a game type setting. 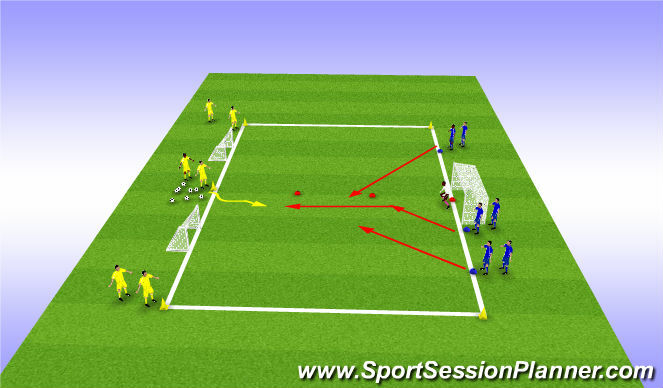 -Players also need to understand that once they win the ball they transition into attacking.